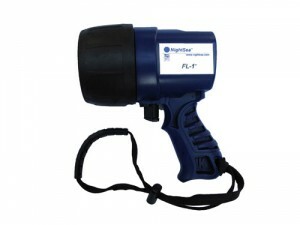 The FL-1 light was designed specifically for finding fluorescing corals, especially small juveniles, in the daytime. Finding fluorescence at night is easy, but night diving is not practical at all locations. The FL-1 has two blue fluorescence-exciting LEDs. One operates in a steady mode for use at night or in a dark room, but the other operates in a flashing mode. When you are wearing the Filter Visor for diving or the Filter Glasses on the surface you won’t see the flashing blue, but if the light strikes anything fluorescent it will produce a corresponding flashing response. Our eyes/brain are finely tuned to detect flashing, much more so than for small changes in steady state intensity. The flashing of even very small corals will catch your attention. The FL-1 has been used successfully at many locations, depths, and times of day. The FL-1D Dive Package ($575) includes the FL-1, one Filter Visor, and one Mask Strap Wrapper for outfitting a single diver. The FL-1B Buddy Package ($615) includes an additional Filter Visor and Strap Wrapper so that two divers can share the fluorescence experience with one light. The NIGHTSEA BW-1 Blue/White Light now also incorporates an optional flashing mode and is an alternative to the FL-1 for coral researchers. There are pros and cons to each – see the article on choosing between the FL-1 and BW-1 for coral recruitment research.